camming mechanism. On the other hand, a seal of the form shown in fig. 4-/B will tend to be expanded by the explosion of the propcllant charge. Therefore the mating surfaces are forced together, not only by the thrust of the camming mechanism, but also by the extremely high pressure of the powder gases. Under the combined actions of these forces, a very tight seal is effected and leakage is practically nonexistent. It is interesting to note that this excellent sealing method can be found in percussion cap revolvers which date from more than 100 years ago. « o the cylinder complicates the cylinder mounting and increases the problems involved in the design of an accurate cylinder indexing mcchanism. 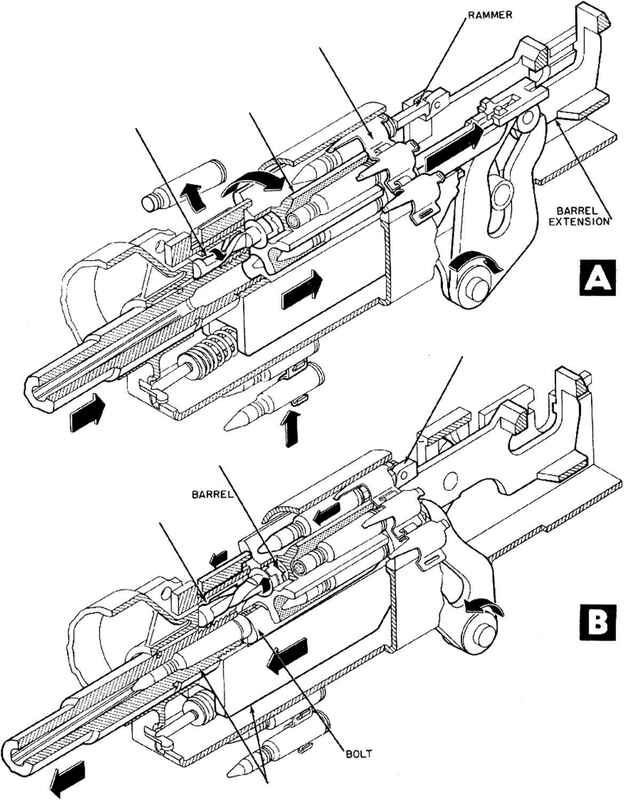 Also, the reciprocating motion which must be imparted to the cylinder requires additional mcchanism to be built into the gun and this mcchanism must be ruggedly constructed in order to handle the large forces it must absorb. Furthermore, the forward motion of the cylinder must occur before a round is fired and then, after the chamber pressure has decreased to a safe value, the cylinder must be withdrawn before it can be rotated to place the next round in the firing position. Because the cylinder is of necessity a fairly heavy part and therefore has considerable inertia, both the forward and rearward motions will require some small but significant amount of time which will cut into the time available for the other events of the firing cycle. In a high-rate-of-fire gun where the firing cycle time is in the order of only a few hundredths of a sccond, the time required for moving the cylinder in and out can easily have a tendency to slow down the rate of fire. Another important point is that the sealing rings must be quite soft to function properly and hence can be dented or deformed easily. If such damage to a ring occurs either through some malfunction of the mechanism or as the result of careless handling during cleaning or maintenance, it is likely that the high-pressure powder gases will quickly blow the seal out entirely, thus producing a very dangerous condition.